Steve Jackson Games has been working on releasing Guest Artist Editions of their various Munchkin games. Who doesn't love alternate-art versions of their games? I've long been a fan, anyway. 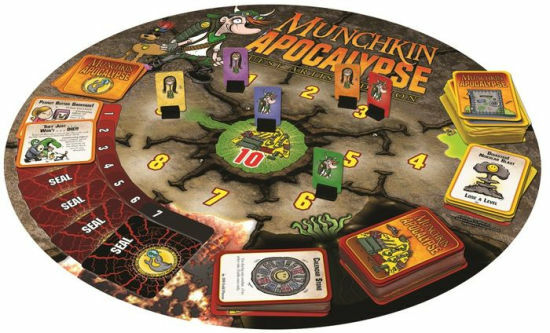 Well, those who like Munchkin Apocalypse and Munchkin Apocalypse 2 can now get alternate art versions of them. This edition is more than just new art, though. There's a circular game board that's just available in this version. You also get 12 player standees. The artwork was done by Len Peralta who also did the artwork for Munchkin Apocalypse 2. So everything matches up nicely that way. The versions are exclusive to Barnes & Noble stores and webshop. So you'll want to head there in order to get yours.